Driving yet another stake into the dark heart of Blockbuster Video, Redbox movie rental kiosks now offer videogames. This should really come as no surprise to our loyal, incredibly attractive readers, as we reported on the company's videogame rental test run only two weeks ago. What is surprising however, is the wide selection of new titles you can now find at the nearest Redbox machine. The official site has a comprehensive, idiot-proof list, but notable standouts include Duke Nukem Forever (despite its questionable quality, you can't deny that it's a quality "get" for service), inFamous 2, LA Noire and Brink. Redbox also offers Marvel Vs. Capcom 3 in what I assume is a clever ploy to win my journalistic favor. Well played guys. In case you're unfamiliar with the Redbox concept, I'll explain. Redbox is a relatively new company that boasts 27,000 kiosk locations throughout the United States. At some point you've likely seen their kiosks; they look like bright red soda machines, only without the 20-year-old RC Cola label on the side. When you want to nab a rental from one of these kiosks, you approach the machine, greet it politely, then use the touchscreen to select your film or game. DVDs will set you back $1 per day, Blu-Ray discs $1.50 and games $2. 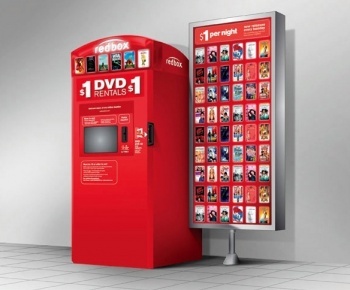 Rental returns are as simple as popping the disc into any Redbox kiosk. The impressively clever bit is that instead of stocking each kiosk with thousands of films and games, the machine writes your selection to disc(s) on the spot. Redbox saves huge amounts of cash by not having to maintain a brick and mortar rental store, and you never have to worry that your selection will be out of stock. Personally, I'm in the "Netflix is the future of media" camp, but I fully admit that the Redbox business model is brilliant. The downside of course, is that the combined powers of Redbox and Netflix are figuratively murdering mainstream movie rental chains. Hollywood Video closed its doors last year, and if you spot a Blockbuster in the wild it is said that you will be granted three wishes by rubbing its horn. Honestly, it doesn't matter. Redbox, like so many angry demonic bulls, has won. All hail Redbox.